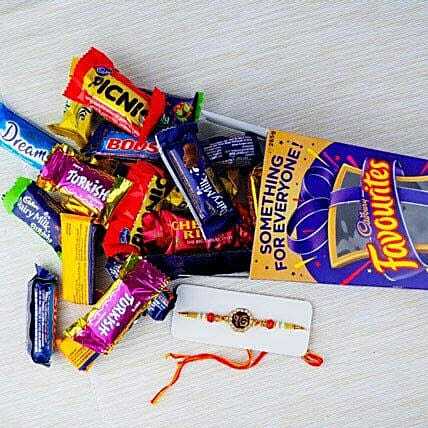 1 Rakhi Bracelet (Rakhsa Bandhan Gift) 1 Box of Cadbury Favourites Â (Cadbury) 1 Set of Roli Chaval (Tilak) in pouch Important Information: This item is only for shipping in Australia. We ship this item from Australia by using Australia Post or local Courier,Â Tracking number will be available. Orders received after 2:00pm (Australia EST) we will ship next working day. Orders received after 2:00pm Friday or orders received over the weekend are processed on Monday (Unless a public holiday coincides) and regular delivery schedule will apply. If the Recipient is NOT AT HOME to receive the product, Postman/courier man may choose to leave the product at the post box, door or leave a calling card to contact the courier company to arrange re-delivery or pickup. We use highly reputable Third party courier companies and will make every effort to delivery date, however occasionally delays are possible which is out of our control. We do not accept responsibility for Third party Post/Courier delaysÂ and delivery charges are non-refundable. Please refer Terms & Conditions for more information.